Earn up to 19,750 reward points. Programmable to burn up to 1,000 discs without a computer! For unattended disc duplication runs, let the Microboards HCL Autoloader handle the workload. With a state-of-the-art robotic arm and four drives, the copier will burn up to 68 CDs or 48 DVDs per hour. No computer is required for the HCL Autoloader's complete standalone operation with a maximum 1000-disc capacity on each drive. Multi-Master Recognition Technology (MMRT) loads multiple masters at once to run multiple duplication jobs in succession. It features a sticky media separator option to better separate sticky media. The CD and DVD burner also has a multi-language capability for English and Spanish. 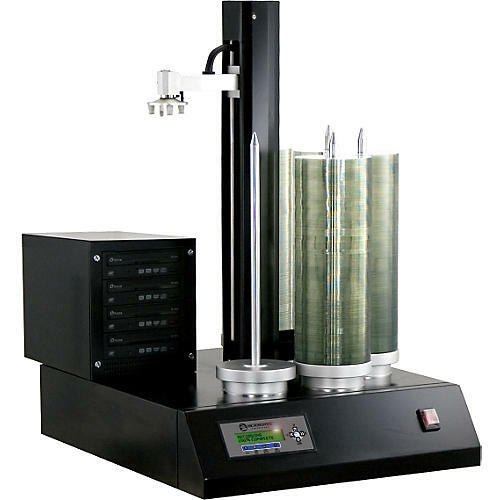 The Auto-Counter displays the total number of discs successfully copied compared to desired output for each project. The robotic Autoloader is the perfect solution for large bulk disc duplication jobs. Order now!